"Sometimes it's up to YOU to bring the planets into alignment." This piece speaks to the idea of creating your own reality. That ultimately, YOU are in the driver's seat and have the ability to make conscious choices on how you wish to live your life. That if you really want something, you can do whatever it takes to achieve that goal. 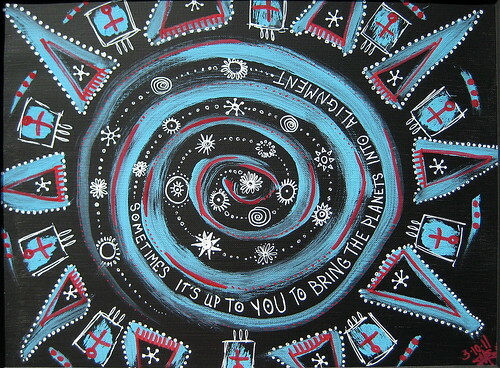 When I create a mandala, I just pick up some form of artistic implement and have at it. I might have a color scheme in mind, but the designs are always on the fly. "Planetary Alignment" is a mixed media piece. Created on 9x12" Canson Acrylic 110lb art paper, I used artist grade acrylic paint, black acrylic gesso, white gel pen and a red Sharpie paint marker. You can purchase this original piece of art in my Etsy Shop.